Real Madrid beat former manager Jose Mourinho and Manchester United 2-1 in the UEFA Super Cup, but none of that matters. 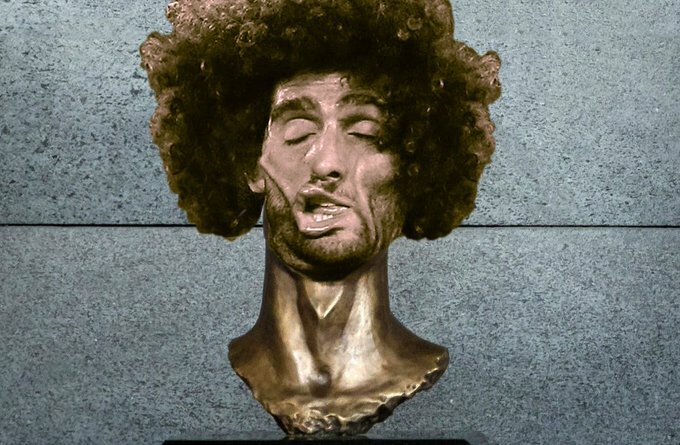 All you need to know is that there was a lot going on with Marouane Fellaini’s head during this game. Fellaini came off the bench in the 56th minute and quickly produced two photo opportunities that will be difficult to top this season. First, his face looked like it traveled through time and space in a way that no face has ever done before. Then he had to have a cut on his head stapled shut, leaving him with an absurd looking bandage and wrap combo. That’s it. That’s all you need to know about the UEFA Super Cup this season. Good luck trying to sleep over the next year. UPDATE: Fellaini is now street art in Australia.